I will be heading out for a few days over the holiday weekend, so I may not get any blog posts up here until sometime next week. Never fear, there will be plenty of fishing in my weekend, plenty of family time and one big family chore we do every Memorial Day weekend. Tune in again next week for the report and stories. Until then, just for fun, I am posting the following video clip. Those of you who are fly-anglers will appreciate this one. Make sure you watch past the commercial at the beginning. One of my nephews sent me that clip; I have had it for awhile. This is the nephew who is a fly-fishing fool and is guiding on the Bighorn River in Montana. I heard that last week he got to guide everyone from 20-year old girls who had never fly-fished before (I am still waiting for pictures) to 70-year old gentlemen with artificial hips and knees. And getting paid for it! A redear from Memorial Day weekend last year. need places to vacation,love to fish big bluegills. thinking nebraska for 2010 or 2011. We have some! 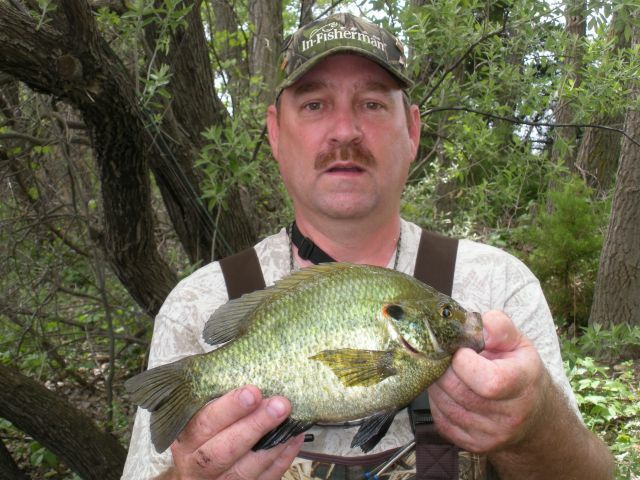 Take a look at these while you are making your plans, http://outdoornebraska.ne.gov/fishing/pdfs/FishForecast.pdf , http://outdoornebraska.ne.gov/fishing/programs/sampling/2009/pdf/I80%20Lakes%20East%20of%20Gothenburg%202009.pdf , http://outdoornebraska.ne.gov/fishing/programs/sampling/2009/pdf/2009%20I80%20survey%20summary.pdf .